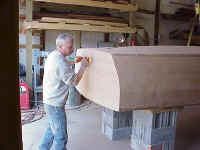 Fairing the hull, deck, and transom of a mahogany boat can be tedious, seeming unending work only if you are not paying attention to what you are doing. This one phase of a restoration will make all the difference in the final appearance of the boat. If you have repaired and re-fastened the frame work and bottom planking and re-planked or refastened the hull and deck, you should take this opportunity to do the job right and seal it well so that it will be trouble free for many years to come. If you have not re-fastened the entire structure from the keel out then you should probably not spend to much time on this phase as you will be removing stock from wood that is liable to move out of shape anyway. At this point the hull should be securely blocked high enough off the floor so that you can comfortably address it. 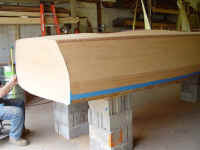 Lower for the deck, higher for the topsides and transom. A height-adjustable shop stool on wheels will make things much easier at this stage as well. Make sure you have recorded locations of the water line, so that it is not lost. These should be marked with a chisel at least at the stem and transom so they can be connected later with a water level or a laser level. The curved surface of the hull's frames, with the usual four plank-to-frame screws, pull the plank into shape. The same will happen two feet away at the next frame. The area of the plank between these frames, however, is attached to the framework only at the edges of the plank to the plank battens. This area between the frames will exhibit the plank stock's original flat surface, leaving the hull surface faceted at this point. The hull's overall curved shape will be made of series of flat planes. If we are discussing the topsides, forward, where the flair of the hull creates a concave surface between the sheer and chine, more stock must removed from the center of the plank than at the edges of the plank to fair in this curve. If we are discussing the top-sides, aft, where the tumblehome creates a convex surface between the sheer and chine, more stock will be removed from the edges, of the planks then from the center in order to fair in this curve. The same will be true of the convex surface of a crowned deck. Cut cross-sections from your old plank stock to witness this effect. These areas can be carefully prepared in the initial stages of fairing with the most aggressive grits and tools. Think of your approach at this stage as sculpture. You will be carefully removing a known (at least intended) amount of wood with a tool that you have practiced with and know the amount you are removing. One of the important lessons in carving is knowing when to quit. You can always remove more material; you cannot put it back. After all the work you've done to get to the finishing stage, you want to make sure you spend the time and effort necessary to not only make your boat look as good as ever, but protect it from moisture and make it last. With the restoration so close to completion, it can be tempting to rush to the varnishing stage. Be patient. Surface preparation is critical to the quality of the job. Final sanding should always be done by hand, in-line with the grain. 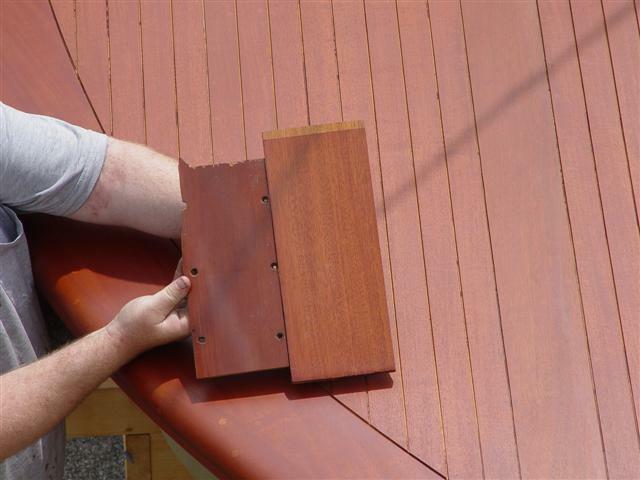 When you have opposing grains at adjoining pieces of the deck planking such as where fore and aft deck planking meets the curved covering boards, you can tape off one of the pieces to avoid noticeable cross grain scratches. Use low-tack tapes here to avoid ripping grain slivers from the bare wood surface, such as Scotch #2070 Safe-Release, or similar. Do not leave this tape on the surface long. 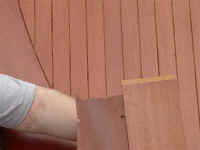 Tape off the covering boards and the edges of athwart ships planking at cockpit bridge-decks as well as the top of the transom planking. You may now make sure the ends of the fore and aft deck planking are finish-sanded in-line and free of cross-grain scratches. Use a bright light at low angles aimed towards you to look for these. When all of these planks are addressed you may now remove these tapes and apply new tape to protect these plank ends. You can now sand the curved covering boards, in-line with the grain, with out hurting the previous plank ends. When sanding, staining or varnishing boat hulls, you should separate them into doable sections. 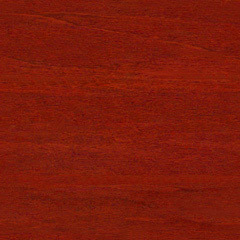 The standard edge between the hull and deck is the line between the lower edge of the covering board and the upper edge of the sheer planks. This line very often delineates a color change between the hull and darker or lighter covering boards. This line is also, almost always, covered with the metal rub rail trim. 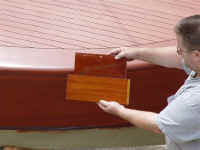 Even if your boat is to be all the same color, it is wise to break it up into workable sections so that you can maintain a uniform wet edge with the materials you are applying. The forward edge of the transom planks is a good place to separate the hull from the transom. This edge is usually covered by the quarter edge guard trim. Since there is usually no trim from the deck to the transom I treat these areas as one unit unless, of course, there is a color change there. When taping off these areas, I use Scotch #2080 Long Mask Blue tape. It is designed for days (not in the sun) without adhesive transfer. I also protect edges with 6-inch general-purpose masking paper, available from auto body supply or paint stores. When taping off areas that require a tight crisp edge, such as when bleaching, sealing, or painting, use Scotch #218 Fine-Line Tape. Remember not to leave this on for long, it has an aggressive high-tack adhesive to keep liquids from seeping under the edge. While I am grinding and sanding the hull through the grits I will apply the exact same sanding procedures to a few pieces of scrape plank stock from the boat. What ever grit you are using on the hull, remember to hit the scrap boards, all the way from beginning to the final grits. 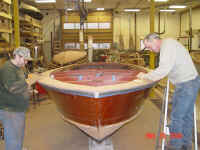 In this manner, you will have plank stock to test your stains on that have been prepared exactly as your hull was. If you bleached the hull, bleach those boards at the same time, with the same number of applications.